If you’re one of the many Sub Zero refrigerator customers with a 500 & 600 series, it might be the right time for an upgrade. Sub Zero introduced their 500 series in 1987 with the 600 series arriving in 1996. With an average lifespan of 18 yo 20 years for the award-winning 500 and 600 series refrigerators, your Sub Zero fridge might be nearing the end of its life cycle. Pro Tip: Contact our sales team at (888)714-4938 for promotions on Sub-Zero refrigerators and Wolf kitchen appliance packages. That being said, many of us avoid replacing a built-in refrigerator that’s been integrated with our cabinetry. It’s a daunting task that can involve a considerable amount of expertise, both when it comes to the removal of the old unit and the installation of the new one. Besides, considering the price tag of a new Sub Zero refrigerator alone might give you a bit of pause. Fortunately, we can offer this helpful guide to take you through the process of making the upgrade. But first, a bit of encouragement—you might think that the newer Sub Zero models have little new to offer, but Sub Zero as a brand has long been focused on ongoing innovation and refinement of their products over time. As a result, each new update to their refrigerator line brings truly innovative and useful upgrades that users will appreciate. With that in mind, let’s take a look at what an upgrade will bring you. What will replacing my Sub Zero refrigerator get me? It starts with a list of truly impressive technology upgrades, each one designed to improve the quality of your refrigeration and use. Advanced tech isn’t all you’ll get by upgrading. New Sub Zero models also offer plenty of convenience and design upgrades, as well. In addition to these features, each new model is engineered to withstand 20 years of regular use, with each unit having been tested rigorously by Sub Zero’s stringent standards. Sub Zero also offers US-based customer support, 24/7, so you’ll never be lost without guidance during use or installation. What model replaces my older model? Finding the new model number that replaces your old Sub-Zero can be a daunting task. We have put together the following charts to help you find the exact model that replaces your current refrigerators. Who can install Sub Zero units? If you’re looking to have a new Sub Zero refrigerator installed, your best first step is to reach out to one of the many Sub Zero expert specialists at Designer Appliances. From there, we can help you prepare for installation step-by-step. Plus, our factory-certified installations add an additional year to your Sub Zero factory warranty. Before contacting us, consider having these resources ready so that we can fully serve you and give all the information we need. 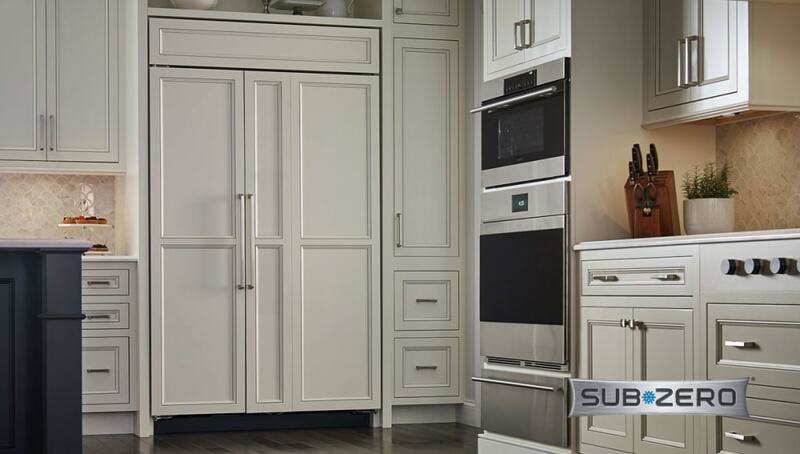 For a limited time, Sub Zero is offering a $1,000 credit to customers who upgrade their 500 or 600 series refrigerator to a new built-in refrigerator. All you'll need is your the serial number from your old Sub-Zero refrigerator. With updated technology, highly improved design and convenience factors, and a robust warranty and credit offer, there’s truly no better time than the present to bring your Sub Zero refrigeration into the modern age. If you want the proven superior quality of Sub Zero with an updated, modern look, upgrade to the Classic BI series today. Is Sub Zero and Wolf the same company? Yes. Sub Zero aquired Wolf ranges some 20 years ago and kept the brand name intact. Are there incentives in purchasing a Sub Zero refrigerator with a Wolf Range? Yes. Company runs occasional promotions to encourage package sales. Please contact our sales staff to get more information on available incentives. Are Wolf Ranges worth the price? We believe so. However, it is worth reviewing the Wolf ranges in detail before making this expensive purchase. We have various up and close video reviews as well as blog post that might help you.